BioCode's Notes: In the ERA of science communication, Why you need Twitter, Professional Blog and ImpactStory? In the ERA of science communication, Why you need Twitter, Professional Blog and ImpactStory? Where is the information? Where are the scientifically relevant results? Where are the good ideas? Are these things (only) in journals? I usually prefer to write about bioinformatics and how we should include, annotate and cite our bioinformatics tools inside research papers (The importance of Package Repositories for Science and Research, The problem of in-house tools); but this post represents my take on the future of scientific publications and their dissemination based on the manuscript “Beyond the paper” (1). Publications: The main paradigm of science communication during the last sixty years has been represented by the peer-review system, where editors and reviewers judge the scientific merit of submitted manuscripts on behalf of their communities. Currently, this traditional approach is changing due to the growing popularity of blog posts, videos and Preprints. From my point of view, some of the manuscript types usually hosted by traditional journals, such as Perspectives, Short Communications, and Technical Notes, are migrating to blogs posts, where they enjoy the benefits of open discussion and reader-driven rating systems without the meddling of god-like editors. In the last ten years the diversity of research outputs has increased dramatically, a dataset or a source code can be more appreciated by the community than their research manuscript. Then, we will increase in the near future the number of cites to datasets, code, opinions or blogs posts. I don’t think the peer-review system will die, instead, it will be adapted to a more democratic and open environment where the community opinion will increase the credibility of the best results. At the same time, centralized systems or repositories (silos) will survive as well-curated and organized points of research data (papers, data, code). Data: To interconnect and increase the publication system scope, researchers now share their data sets in repositories such as GenBank, ProteomeXChange and ArrayExpress. They use code repositories such as GitHub, CPAN, CRAN and GoogleCode to share code. 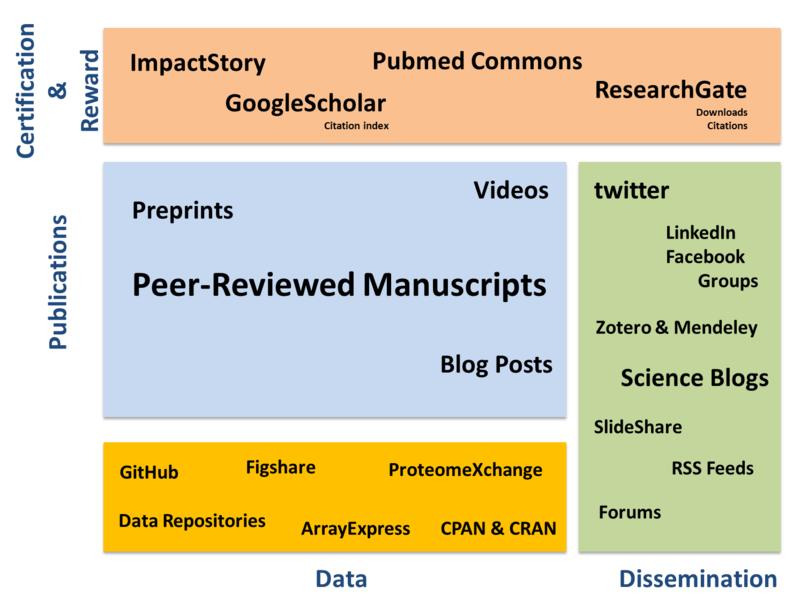 figshare allows users to upload any kind of research data format (figures, datasets, media, papers, presentations) in a way that the current scholarly publishing model does not allow. Scientists are increasingly concerned with the reproducibility of their published results as well as the reusability of their data and code to draw new scientific conclusions. Dissemination: The scholarly exchanges of academia are moving from classrooms, workshops and meetings to social media platforms such as Twitter, blogs, Facebook/LinkendIn Groups. As in other spheres of life, social media can simplify and expedite the dissemination of good manuscripts, tools, raw datasets or simply ideas. In a globally connected world where millions of people do science and millions of manuscripts are published every year, social digital networks facilitate the rapid communication of the best results and data, easing the access of the research community to opinion leaders and providing a nurturing environment for open discussions. Certifications/Reward: Peer-review will move into the open and become another public research product. The roles of the reviewer and editor will metamorphose from that of a gatekeeper to those of a collaborator, from an individual perspective to a community judgment. GoogleScholar’s citation system (where theses, web pages and preprints are also considered) ranks publications by relevance based on the number of citations, while ResearchGate’s download and citation numbers can be used as a measure of the acceptance of a manuscript by the community. The efforts of PubMed Commons are oriented to the retraction or endorsement of manuscript contributions. ImpactStory displays transparent and normalized metrics that reveal the diverse manners in which an article makes an impact. The new ERA of science communication will claim scholarly products (blog posts, tweets, preprints, research papers, citations, data, code and presentation shares) rather than manuscripts. In the near future a research department will need more than good results or data for manuscripts or money to send members abroad to workshops and congress; they will need a complete system of twitter accounts, blogs or science media profiles to communicate its research. For researchers the advice follows a similar theme: it is becoming imperative to adapt and use those resources to be in touch with real-time science. In the future, science will be more open and decentralized, and we will jointly decide what the best ideas are, rather than having to believe blindly in Editors, Reviewers and Journals. Start a startup or Work for someone else? Most read from the Journal of Proteome Research for 2013.